Get in and put your seat belt on! 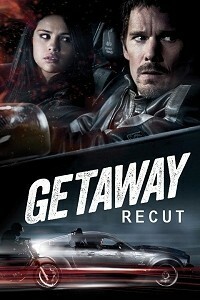 Getaway is a car chase movie, so don't expect the finest story ever written, but it does have some great driving scenes if you are a sports car nut or motor head like me! Unfortunately it also has some of the worst cheesy dialogue, mostly by Salena Gomez who I'm sure the movie creators thought would be perfect as the annoying teen, so I don't entirely blame her. Her dialogue definitely needed trimming to make the overall movie more watchable and enjoyable. For most of the movie there is a lot of unnecessary destruction, and I wanted to tame it down a little. Then there is what I consider to be the best scene in the film, and it is a homage to the classic 1970's short film, Le Rendezvous. I wanted to make the viewer feel as much as possible they are in the car with Ethan Hawke as this scene plays out. The movie is in M4V format (Same H.264 compression as MP4) and with Dolby AC3 5.1 Surround Sound. Please note that if you are using a PC then you will need an AC3 filter/driver to hear the audio, otherwise a modern television or Media Center will support it. I wanted the movie to feel more believable in terms of the car chase scenes, which meant taming down the destruction a little. I also wanted the dialogue to be less cheesy and annoying. There are about 30 cuts in this version. It is mentioned early in the film that the car has been "armored" which helps explain how the car could possibly survive what it goes through, but I still wanted to make the film feel more realistic by reducing the level of carnage. Lots of short trims to achieve that, in addition to many parts of the dialogue being cut, resulting in 4 minutes of the film being removed. seamless. best way to describe this one. any changes made, i didn't see or hear. i was hoping for a less cheesy version and that's what we got. no plot-holes or sudden story puzzles. Avid4D thus far always does top notch work. look, i gave this 10s across the board because the work seamless, the story is still sound and the a/v quality is what you'd hope to see. it's a simple project in only removing 4mins, but it elevates the movie above the studio release, which was the goal. i would have liked to have a few less taunts to Hawke's character during his timed trial, but that's a personal preference and didn't detract away from my enjoyment of Avid's version here. it's a fun and less Hollywood-y lazy-tuesday night popcorn movie.